Held every month from January through August, 4th Friday draws hundreds of visitors to Harvard’s Starline Factory for a one-night-only juried art show. Around the time Nancy Merkling finally had enough of the typical wine-and-cheese art event, she had an epiphany. For nearly 15 years her ideas percolated until, in 2011, Merkling finally launched a one-of-a-kind art show. The result is 4th Friday at The Starline Gallery, located in the Starline Factory, 300 W. Front St., in Harvard. In five years, 4th Friday has become one of the most dynamic art attractions in the region and, perhaps, one of the area’s best-kept secrets. 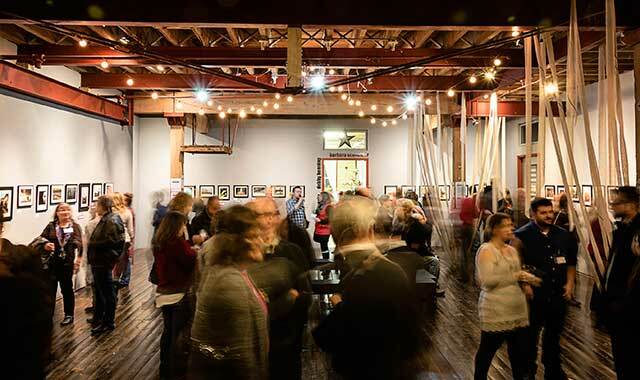 Held on the fourth Friday of the month from January through August, with a year-end gala in October, this event draws as many as 1,000 people to a one-night-only juried art show. With an emphasis on local talent, this show includes works of traditional and contemporary styles in two-dimensional paintings, drawings, photographs and block prints as well as three-dimensional jewelry, clay or sculpture. Three or four stages are positioned for live musicians. Visitors can expect a few surprises mixed in, like installation artwork and interactive performers. Quality artwork is a priority, above all. Every piece on display has undergone a rigorous jury process, led by a team of credible judges from the region and around the nation. As many as 150 artists submit work each month, but only up to 110 pieces are accepted: up to 60 mixed media pieces for the first-floor exhibit and up to 50 photographs for the upstairs photo gallery. Merkling makes no apologies for her high standards. One distinction between 4th Friday and the typical the wine-and-cheese opening is Merkling’s emphasis on buying artwork. For some of Merkling’s 80 volunteers, it’s their sole job to recruit buyers and attend art events in places like Chicago, Milwaukee and Madison, Wis. Buyers often arrive from those large markets. Visitors to a 4th Friday can enjoy much more than the main displays of juried artwork on the first and second floors. The sprawling, five-block Starline building is home to some 40 artists who maintain personal studios. An additional 22 studio spaces are currently under construction, with plans to add more in the coming years. There’s currently a waiting list of nearly 50 artists. The old factory, which once produced farming equipment, has been steadily resurrected by Orrin Kinney over the past two decades. When 4th Friday began in 2011, the building was very much a diamond in the rough. But today, Starline doubles as a popular wedding venue and is home to Harvard’s WHIW radio station. A ground-floor pub, The Stanchion, serves food and drinks on weekends and during social events. Artists who set up in Starline find an inherent value in not just the building but the 4th Friday experience. Merkling points to one studio that’s occupied by a Woodstock-based flower shop. Roscoe-based art photographer Sherry Pritz has shared studio space in Starline since 2015. She, too, finds value in opening that studio during 4th Friday. But at 4th Friday, the artists do show up, and that’s a point of pride for Merkling. The way she sees it, she’s creating a marketplace where artists are serious about their business and art aficionados are eager to buy. Merkling is also taking her mission to families, encouraging them to begin their own collection of quality artwork. Pritz recently met a 6-year-old whose grandmother prompted him to start a collection. Amazingly, the event is funded entirely by Merkling and Kinney – no nonprofit support, no grants. This is a business. Merkling constantly dreams of new ideas she can bring to 4th Friday, but she’s grounded in the idea of drawing together artists, buyers and art lovers into a unique experience in a colorful location. 4th Friday occurs on the fourth Friday of the month, from January through August. A year-end gala is hosted in October. For information on the next show, visit nancymerkling.com. This entry was posted on Friday, July 29th, 2016 at 11:59 am	and is filed under Arts & Entertainment. You can follow any responses to this entry through the RSS 2.0 feed. Both comments and pings are currently closed.